Dubai, UAE, September 09, 2018: If you’ve been pulling your hair out (literally) with your hair loss woes, you can relax and worry no more as cosmeceutical haircare expert Anivagene has finally launched its unique product range in the UAE. With full FDA-approval, the Halal haircare collection has been championed by leading dermatologists across the globe as one of the only treatments on the market today that offers lasting results post-treatment. The innovative brand has dedicated decades to fine-tuning its patented formula to offer visible, long-lasting results, using a special mix of highly concentrated and effective ingredients. Each of the scientifically proven products are free from parabens and allergens, with each unique formula dedicated to the root of the causes of hair loss. The dermatologically and clinically tested collection of products for men and women strengthen the hair from the root to the tip whilst nourishing the hair fiber to prevent further loss and thinning. It also improves the health of the scalp, which is a vital component for long-term hair health. 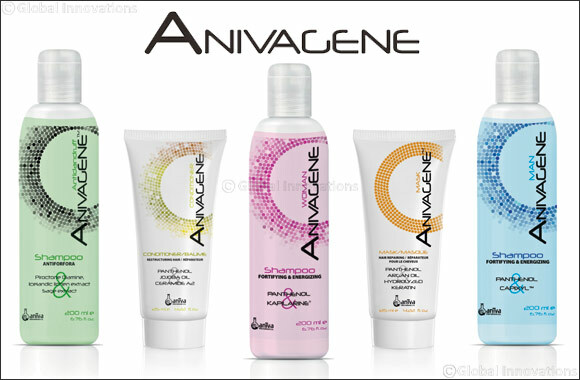 Including the Anivagene Shampoo that cleanses and nourishes hair whilst maintaining the delicate balance of the scalp, Reconstructing Conditioner to repair fragile and damaged hair, Repairing Hair Mask with Argan Oil and Keratin that hydrates and protects from breakage along with an Anti-Dandruff Shampoo that reduces inflammation of the scalp and eliminates the micro-organisms responsible for dandruff. Anivagene aims to produce high quality products that guarantee long-term results to provide a real solution to hair loss and simultaneously boost self-confidence.